I have also found The Great Egg Hunt entry so here is the link. I’m afraid these were all I could find though. I have found the Shakespeare comes to Compton entry so here is a new link for anyone who wants to see. I have found the Compton site again but some of the reports have been deleted. I will put the ones I can back on our site. My, hasn’t the rose bush grown! 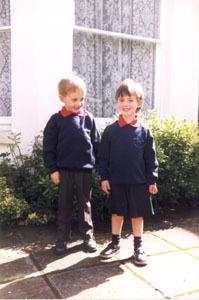 On your left, Tom and Clara starting school in September 1998, in their shiny new shoes and too-big uniforms. 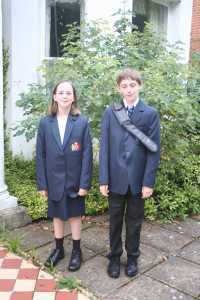 And on the right, the same scene in September 2005. Spot the differences.